“Birthright” won SPECIAL Jury Award !! Asian New Talent Award Film Competition. “Birthright”is invited to four Festivals !! “Birthright” is invited to three Festivals!! East End Film Festival nominated! “Birthright” is nominated for Competition in World Strand at East End Film Festival in England, which is going to be held from April 27th, 2011 to May 2nd! 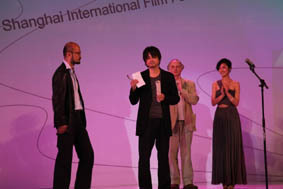 Invited to Japan Film Festival Los Angeles 2011 !! “Birthright” is invited to Japan Film Festival Los Angeles 2011 !! The Osaka Asian Film Festival 2011 which our film will be screened in the “Special Screening” section will start from March 5th, and the 13th Deauville Asian Film Festival (France) that our film is nominated in the “Competition” , will start from March 9th,2011. In the “Competition” of the 13th Deauville Asian Film Festival, there are 3 other nominees of Japanese films besides 「Birth Right」,which are 「Cold Fish」direted by Shion Sono, 「Norwegian Wood」directed by Tran Anh Fung, and 「Sketches of Kaitan City」directed by Kazuyoshi Kumakiri. We will screen our film in Osaka Asian Film Festival 2011. We will screen our film in the “Special Screening” section in Osaka Asian Film Festival which will start from March 5th, 2011. The opening of Goteborg International Film Festival(Sweden) today!!! 「Birth Right」will be screened in the “FIVE CONTINENT” Section on Feb.4th,5th,and 6th 2011. We will screen our film in the “FIVE CONTINENT” section in Goteborg International Film Festival (Sweden) which will be held from Jan.28, 2011. We are invited to 2 more International film festivals in France and Estonia. We are invited to 2 more International film festivals after Tokyo International Film Festival.